Three blogs posts out of making soy milk — I guess I’m really milking this topic! I was “carrageenan-free” for four weeks (somewhat ironically, I broke my carrageenan fast not with soy milk, but with heavy cream). Aaaaannnnnnddd . . . for better or worse (better = I guess it’s okay for me to consume some carrageenan; worse = less incentive to keep making soy milk), I have seen no difference whatsoever. Not terribly surprising, given that I wasn’t having any [known] GI problems going into this. Could regular, low-level consumption of carrageenan have a negative, long-term (and as yet unseen) impact on my health? Sure, but the reality is that we all consume, or are otherwise exposed to, many things that could fit in the “unknown long-term effects” category. Life is one big long-term unknown. So unless more research comes out, health concerns about carrageenan will not be a major motivating factor in continuing to make my own soy milk. Silk Organic Unsweetened Soy Milk: I currently pay $3.30-$3.50 per half gallon. At first glance, the savings are significant, about $1.20/quart of milk. I’d say we average a half gallon a week, so over the course of a year, that’s $125 saved. Coincidentally (or not???) that is almost exactly the price of a brand new soy milk maker. Of course, that forty-four cents per quart price starts creeping up if you want a tastier product. As I mentioned in my last post, my favorite version thus far involves using a combination of soy beans and cashews, along with small quantities of sea salt, sugar, and vanilla. I haven’t crunched the numbers on this; I’m guessing it’s still under one dollar per quart, but it does start cutting into the savings of making your own. I discovered that hulled soy beans led to better tasting soy milk. My searches for organic, hulled soy beans (essentially, split soy beans, because the beans split in half once the hull is removed) came up empty. While hulling the beans is relatively easy, it does add extra work to the process. If you use a soy milk maker, hulling the beans and clean-up constitute most of the hands-on time. Clean-up works best if you plan to do it right away, before things cool and solidify. The metal grinding chamber/strainer is the trickiest thing to clean. 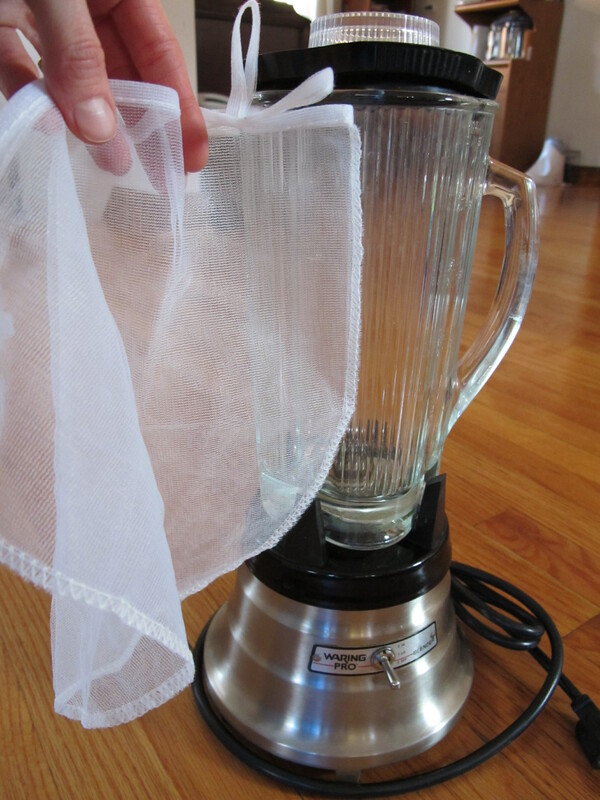 Clean-up for the blender plus nut-milk bag method was actually easier than cleaning the parts of the soy milk machine. However, the non-machine method requires more hands-on time for the blending, straining, and stove-top cooking. Start to finish, I would estimate 35-40-minutes, total, for the machine method. That includes the 20 minutes for the machine to grind the beans and cook the milk (hands-off time), plus 15 minutes for clean-up. For the non-machine method, I would estimate closer to an hour. That is almost all hands-on time, but you can multi-task in the kitchen during the 15-20 minutes of stove-top cooking. If I’m not in a time-crunch, I enjoy the process of making soy milk, but at other times, it feels like one more things on an already too long to-do list. The solids that are left over (strained out) in the soy milk making process are known as “okara.” Commercial soy milk makers likely sell most of their okara for livestock feed, but this nutrient-dense by-product can be used in cooking. Most of the recipes for using okara involve relatively small amounts of okara. Even just making 2 quarts of soy milk per week, I quickly had more than I could use. I’m not really trying to increase the amount of soy in my diet. I’m fine with my level of soy milk consumption, and we occasionally enjoy tofu and tempeh, but that’s enough for me. In the end, I don’t feel too bad about composting [most of] the okara. Adding it to the compost will be good for the garden, and I don’t use the okara when buying commercial soy milk. I did enjoy this recipe for bean and rice croquettes with okara, and I wouldn’t mind experimenting with adding small amounts of okara to pancake or quick bread recipes. If I were interested in cooking with more of the okara, I would freeze it in small, recipe-appropriate amounts (¼ to ½ cup). I returned the borrowed soy milk maker to my friend. I plan to try to continue mostly making my own (blender + stove top method), allowing myself a free, no-guilt pass to use the store-bought stuff when life gets crazy. I’m not ready to plunk down the money for a new soy milk maker, but I’m going to keep my eye out for a used model. The machine does make the process easier and faster, even if I don’t like the final product quite as well.